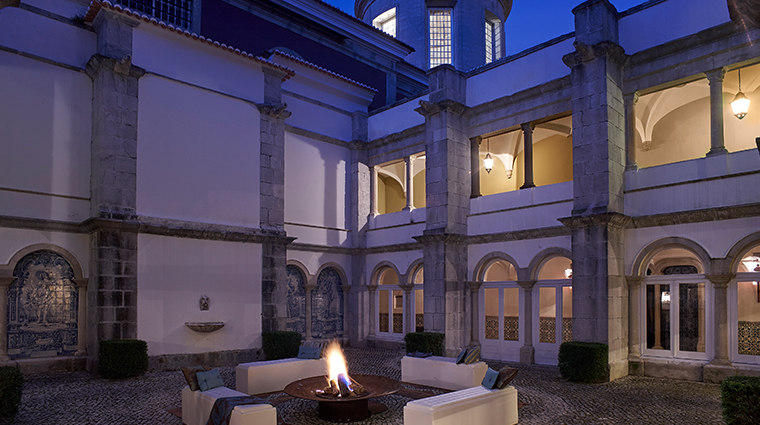 Penha Longa Resort is set within a larger resort that is a destination all its own. 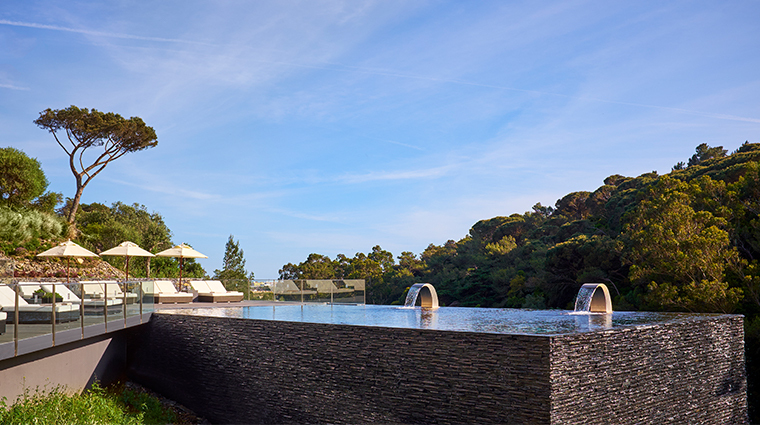 This luxurious complex at the foot of the Sintra mountains has all the facilities you could need for a relaxing stay, whether you’re traveling as a couple, as a family or for business. It is large and varied enough for every guest to find his ideal spot, whether he wants peace and quiet or a more bustling atmosphere. This exclusive Ritz-Carton hotel has six restaurants, a top golf course, a country club, three outdoor pools and one indoor pool, a wellness center and spa, a kids club, mini golf and children’s playground. There’s also a former monastery for events and quiet moments of contemplation. 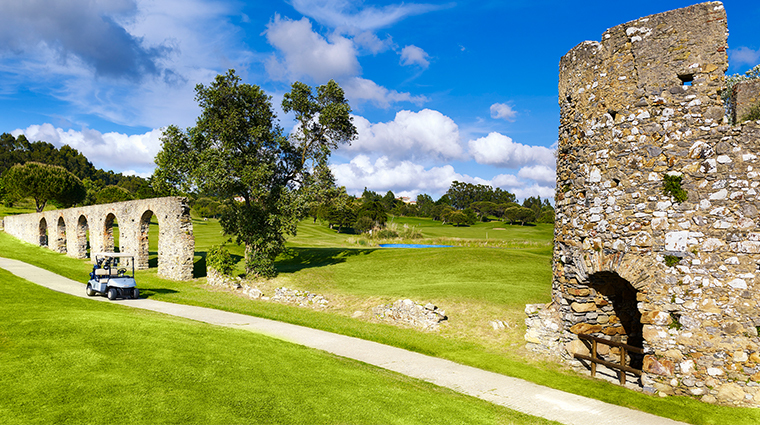 Penha Longa is just minutes from the historical and picturesque mountain town of Sintra, where the Portuguese royal family would retreat during the scorching-hot summers in Lisbon. The mountain is topped with a Moorish castle and a royal palace fit for any fairy tale nestled in a lush, green landscape. 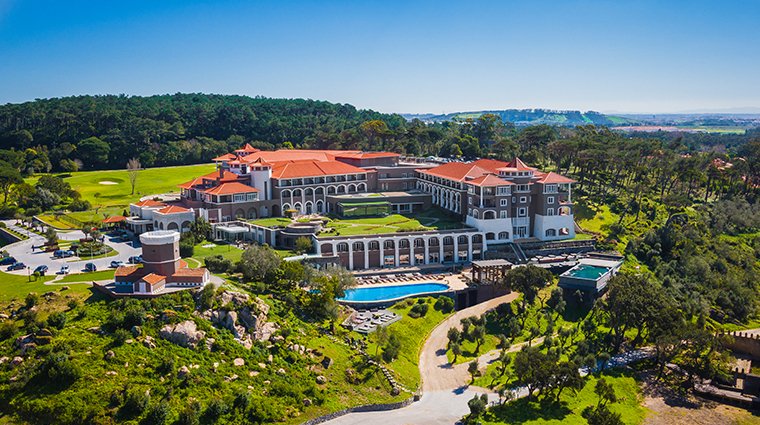 The Sintra hotel, with its monastery and estate, is an integral part of that history, but offers all modern amenities, entertainment, dining and leisure facilities. Both types have balconies with scenic vistas of the resort or the mountains. 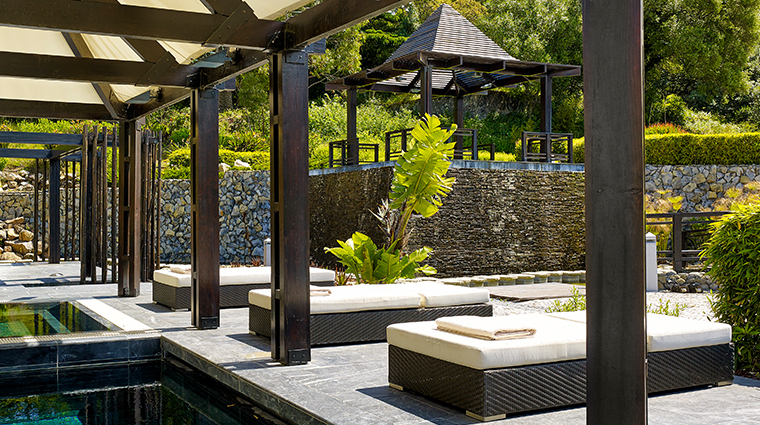 It’s a place where you can choose to relax in the Asian-inspired spa, go for a morning run along sign-posted jogging paths or sit by the pool looking out over the mountainside. Lab, arguably the resort’s most popular eatery, has just 22 covers per evening. It is advisable to book several weeks in advance. We recommend planning your visit during the summer, or a holiday, when the lush resort has fun activities available for both children and adults. Take a trip to the nearby city of Lisbon to see the astonishing street art from Portuguese artists. 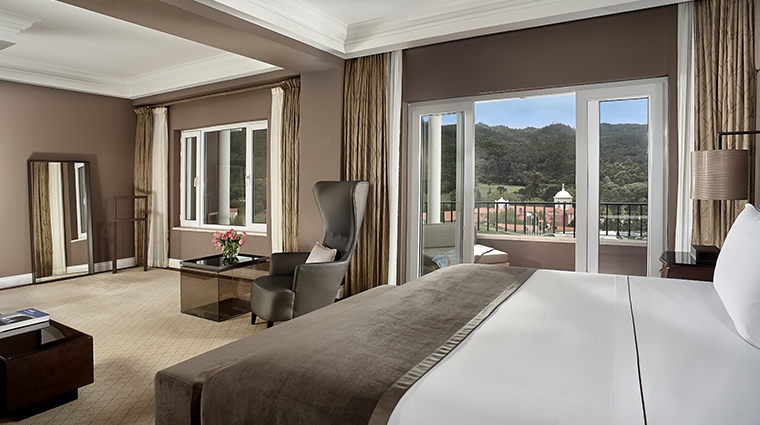 Penha Longa’s 17 suites are set at the corners of the luxury hotel and offer panoramic mountain or golf course views. 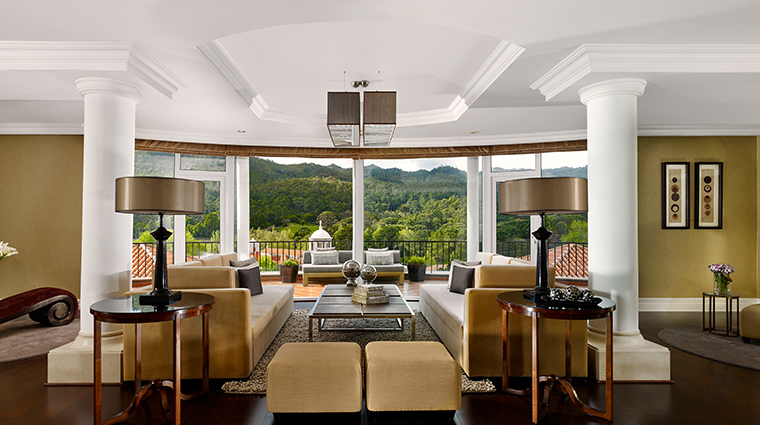 The two-bedroom Imperial suite is the largest at 4,462 square feet and boasts 180-degree views of lush mountain greenery and a bathroom with its own Jacuzzi and sauna. The 194 sumptuous rooms, decorated in warm shades of tobacco and chocolate, are split into deluxe and premier categories and all are decorated similarly. Each room comes with a spacious marble bathroom with separate tub and shower stall. Deluxe rooms are a generous 538 square feet and Premier rooms 645 square feet. 4. Poolside restaurant Aqua and the B Lounge bar in the lobby provide casual options of gourmet burgers, sandwiches and snacks throughout the day. More formal offerings are available at first-rate Japanese restaurant Midori and Italian restaurant il Mercato, where breakfast is also served. 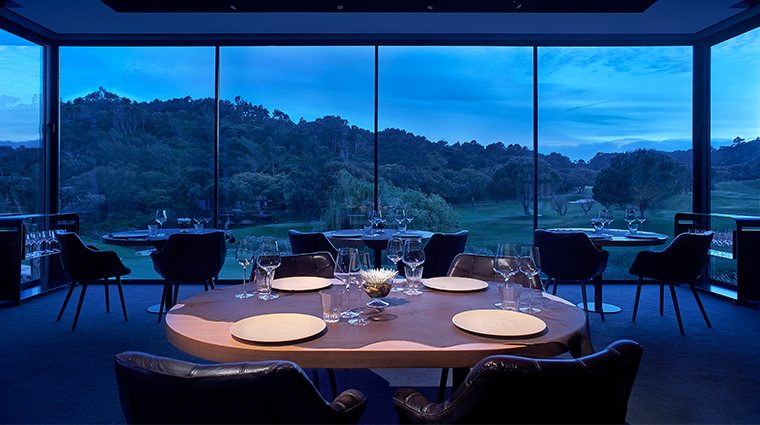 The foodie highlight is the intimate dining experience at Lab by Sergi Arola, a chef who cut his teeth at the famous El Bulli restaurant in Spain. Lab provides three tasting menus and à la carte dining along with a selection of around 550 wines from its exclusive cellar. For a more pared-down taste of the top chef’s food, try Arola, a restaurant that serves Sergi Arola’s more informal recipes throughout the day and with the bonus of no booking required.